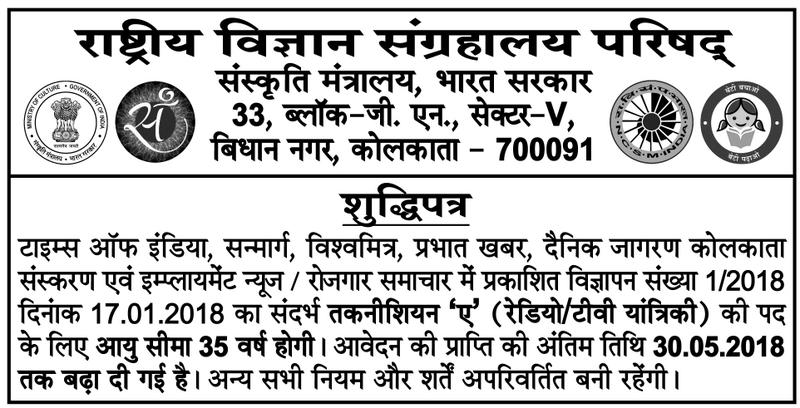 Reference Advertisement No.1/2018 dated 17.01.2018, published in the Kolkata Editions of the newspapers Times of India, Sanmarg, Prabhat Khabar, Vishwamitra, Dainik Jagran and Employment News/Rojgar Samachar. Age limit for the post of Technician ‘A’ (Radio/ TV Mechanics) shall be 35 years. The last date of receipt of application has been extended up to 30.05.2018. All other terms and conditions shall remain unchanged.